The Chinese character (kanji) “wazawai” or “sai” (災) has been named the kanji that best symbolizes the year 2018 for Japan. The kanji is unveiled each year at historic Kiyomizu Temple in Kyoto. Screencap from ANN News official YouTube Channel. 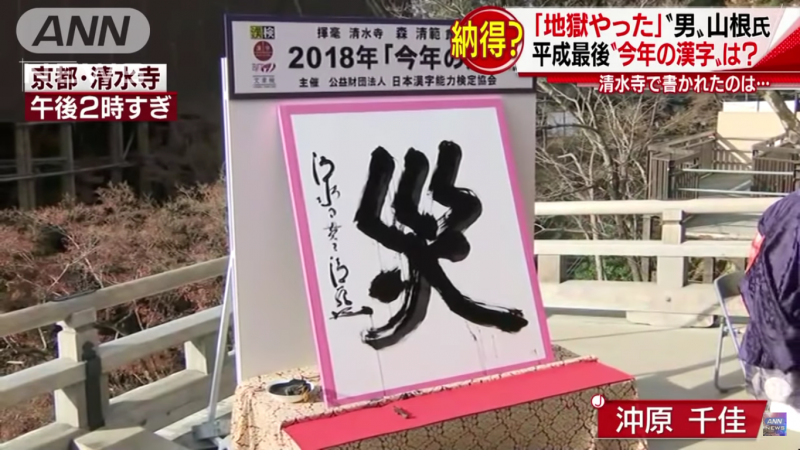 After a year of earthquakes, torrential rains, floods, typhoons and torrid heat, the Chinese character meaning “disaster” ( 災: “wazawai” or “sai”) was named as Japan’s “2018 Kanji of the Year”. Chinese characters are known as kanji (漢字) in Japan. This year’s kanji was selected by the Japanese Kanji Proficiency Society based on the results of a nationwide poll conducted earlier in the fall. Of the 193,214 entries submitted from all Japan, “wazawai” received the most ballots at 20,858. Since, all over Japan, no one knew when calamity (災害) might strike, the number of people who decided to take personal responsibility for disaster preparedness (防災) increased. And since no one could forget the calamities that afflicted Japan, it was a year when many wanted to learn more about how to reduce the effects of natural disasters (減災). — 2018 Kanji of the Year.